As many of you may know, Equiscript has made a long-term commitment to support OneWorld Health and its mission to bring permanent, sustainable healthcare to chronically underserved populations around the world. We began this work in 2017, and have taken part in fundraising, donating, and volunteering in support of the organization. We are particularly dedicated to supporting medical mission trips to the OneWorld Health clinics in and around the Tola, Nicaragua area. My business partner, Steven Kerr, and I participated in a OneWorld Health mission to Tola early in 2017, and we dedicated ourselves to providing support to that region to try to build long-term community health solutions for the people in the region. Later that year, we sponsored part of a team for the December, 2017 medical mission to Tola. This was a great experience for our team and for the group of volunteers who represented nine Equiscript clients from across the country. Click here to watch a video about the 2017 trip. We began 2018 enthusiastic about supporting another trip to the Tola area in December 2018. Unfortunately, earlier this year, the political climate in Nicaragua became unsettled, and we reached a point where it wasn't safe to send volunteers into the region. 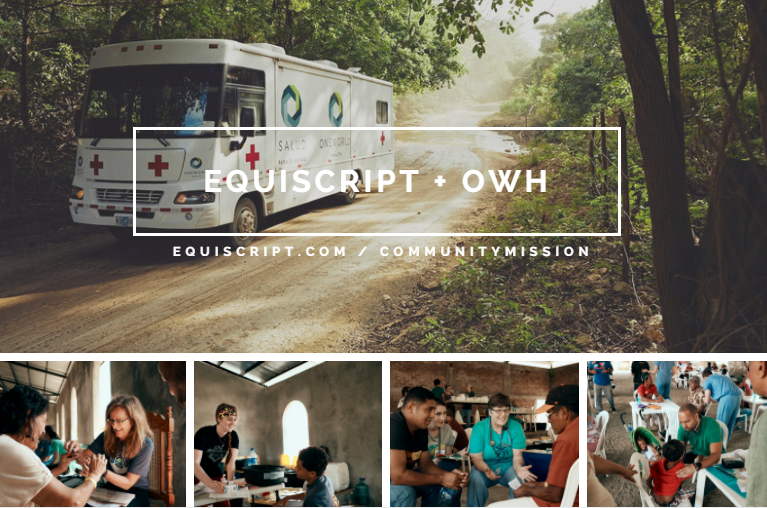 After working with OneWorld Health to find a solution, I am excited to announce that Equiscript will be supporting participation in the May 2019 OneWorld Health mission trip to Costa Rica, because many of our friends from Nicaragua are currently displaced in neighboring Costa Rica. We are thrilled to support the May 2019 trip to Costa Rica as an extension and continuation of our support of the people of Nicaragua. As part of its support for the May trip, Equiscript has spots available for 10 participants. Equiscript employees and employees of our clients are invited to apply for one of the Equiscript spots. Click here for information on applying for the 2019 trip. Click here for more information on OneWorld Health. Thank you to all of our clients, family, and friends for your support of Equiscript and our cause to improve access to healthcare in the communities we serve. I look forward to updating you on our progress as the trip dates draw near.